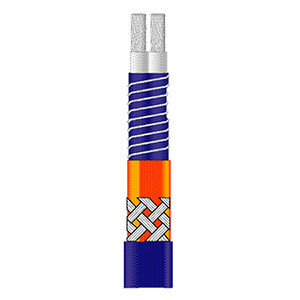 OMEGALUX™ CWM (Constant Wattage Medium Temperature) heating cable is the ideal answer to those pipe tracing situations which require higher temperatures for process maintenance as well as freeze protection. No matter what length of cable is needed, wattage (or heat) produced by each foot of cable remains unchanged. A. Buss wires. Twin 12 AWG copper buss wires provide reliable, consistent electrical current. B. Buss wire insulation. 11 mil FEP jacket protects and electrically insulates buss wires. C. Inner sheath. This insulation jacket holds the two buss wires together and provides the wrapping surface for the nichrome heating wire. D. Nichrome wire. The nichrome resistance heating wire is the heating component of the cable. E. Jacket. Flame-retardant insulation jacket is made from FEP material which protects heating cable and assures long service life. This material is also highly corrosion resistant. F. Metal braid. Plated copper braid covering the jacket provides a positive ground path. G. Optional fluoropolymer overjacket. FEP jacket provides protection from most aqueous and chemically corrosive solutions. Add suffix “-CT” to model number. 참고: *Prices above are price per foot. Steam Cleaning: CWM can withstand 200°C (392°F), 150 psig steam purging of process piping when not energized. Third Party Approvals: See page B-22. Circuit Breaker Selection: To determine the circuit breaker size required divide the Watts/ft (at operating voltage) by the operating voltage. Multiply the result times the total installed cable length in feet. Multiply this result times 1.2 to get the minimum circuit breaker size.